2017 American Gold Eagles – The Best Year EVER? American Silver Eagles (ASE) sales are way down for the year but seem to be on the rise, while American Gold Eagles (AGE) sales have been down and are off by a substantial percentage compared to all other years. In the first half of 2016, ASE’s were on a tear and had the pace set in the first half of 2016 continued throughout the year it would have been another record setting year. However, a funny thing happened in the second half of 2016, sales fell off a cliff and have never recovered. AGE’s in 2016 were also enjoying a great run, not record setting but strong sales month after month. As can be seen in the charts AGE sales are down by some 75% year over year. In April 2017 AGE sales were down north of 90%; that trend has continued in the following months with only a slight improvement in May. If you are a coin collector this year would probably be a good year to add a few AGE’s to the stack, in multiple denominations as the total number of coins minted should be exceptionally low across the board. Personally, I will be picking up one coin of each denomination because of the low mintages. Graded coins should do exceptionally well as the years go by. 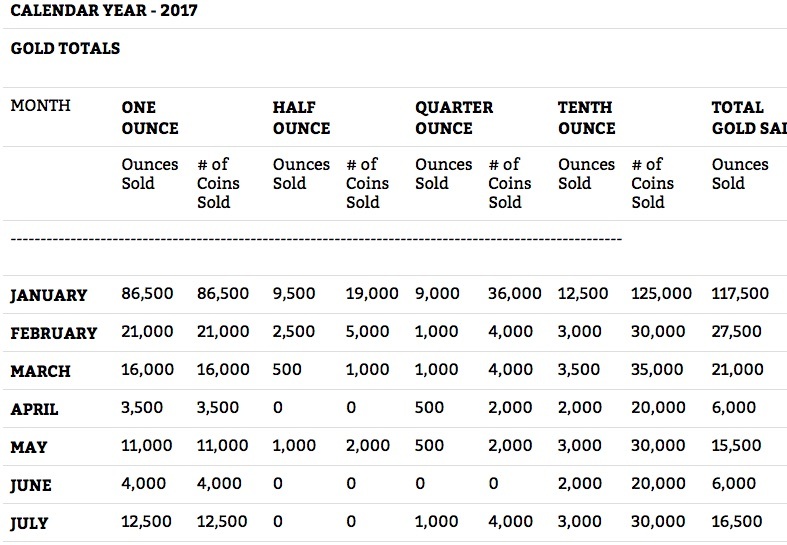 The right side end column on the above charts shows the total number of cumulative ounces sold during the month according the USMint. 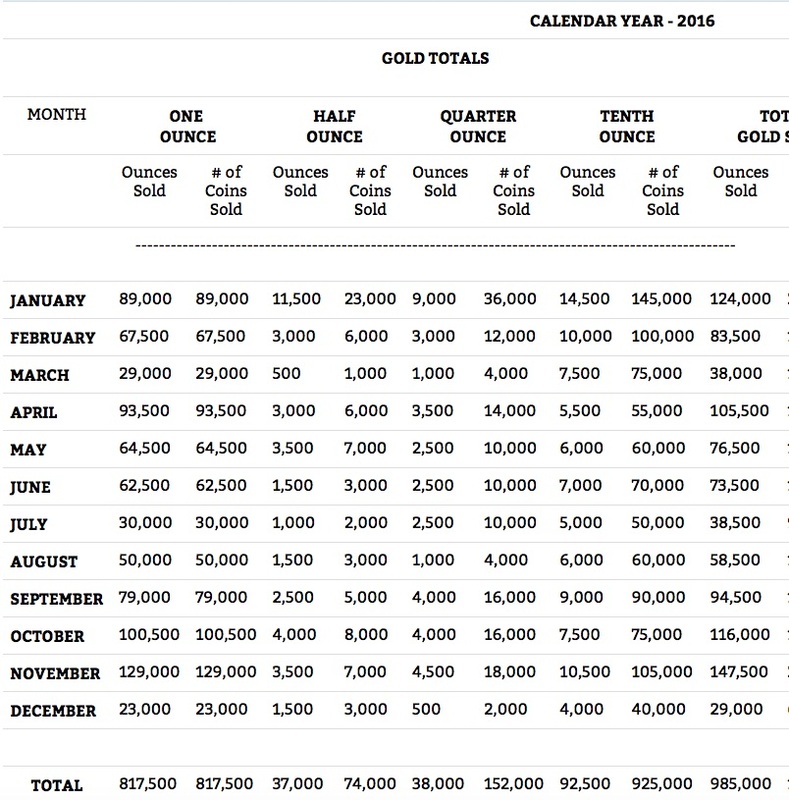 The charts provided by the US Mint show the total of all coin sizes, all gold ounces, sold by the US Mint. The total amount of AGE’s sold by the US Mint shows a dramatic decline in sales. By simply looking at April, May and June 2016 vs same months in 2017 one can quickly see the extreme drop year over year. The total ounces sold during April, May and June 2017 reflects approximately a 60% drop of the total ounces sold compared to June 2016 alone. That should get any coin collectors attention. These numbers have not been seen since 2006 when the US Mint sold a total of 261,000 ounces of gold eagles – the second worst sales year ever. 2017 may not reach 2006 total gold ounces sold as the total ounces sold through July 2017 is a mere 210,000 ounces. If the US Mint drops below 10,200 total gold ounces sold in any of the remaining five months 2017 will not reach 2006 total American Gold Eagles ounces sold and it could fall all the way back to 2002 when the US Mint sold 230,000 total AGE gold ounces – the worst year on record since the AGE program began. The first year sales, 1986, saw a total of 469,500 AGE gold ounces sold with similar numbers for the next five years. This would mean the US Mint would need to sell 4,000 total gold ounces for each of the remaining five months to avoid being the worst (best) year ever for AGE sales. Personally, I’m hoping they miss it and post the best year ever for collectible gold coins!! Where else can you pick up a collectible coin with minimum premium that is recognized around the world? 2017 will either be the lowest number of minted AGE gold ounces or the second lowest. This is the year to add at least one AGE to your stack. Pick the lowest minted coin denomination and pick one up today before the premiums and acquisition cost begin to rise!! What a gift! !